Below please find a growing list of Sheng Zhen brochures and flyers in various formats. Please check the description to see if you will be able to open the item and modify it using your own software (for example you will need Adobe Acrobat to edit a .pdf file, or Adobe Illustrator to open an Illustrator file). You can also convert .pdf files to Word. We will keep collecting files in hopes that you will be able to find something you can work with. Please also feel free to contact us (see below) if you would like to submit a flyer or brochure to this collection for other teachers to use. 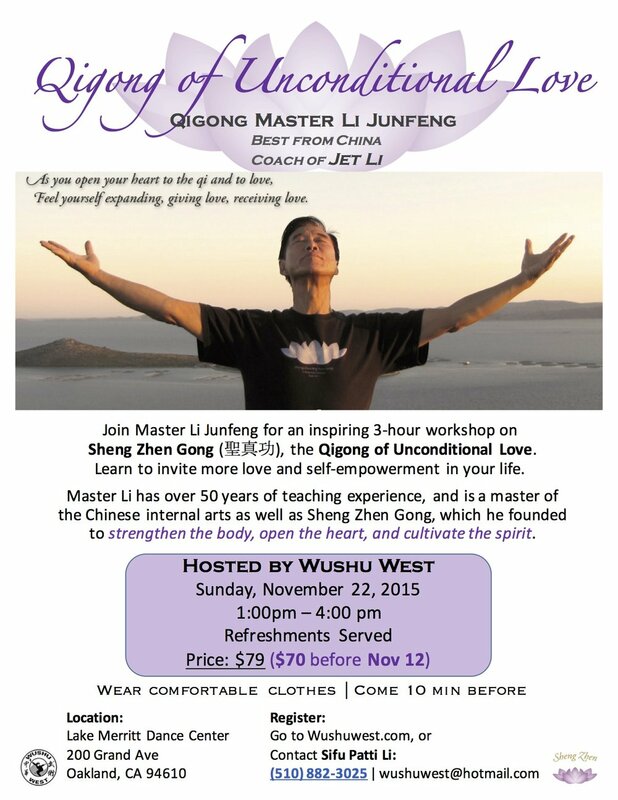 If you need photos of Master Li, Jing or Sheng Zhen students, please go to that section on the Teacher Support Page where you first logged in. We also have a handy supply of Sheng Zhen logos on that page in various formats. This is a generic brochure about Sheng Zhen Gong. It has the Santa Barbara Sheng Zhen center address. You can edit this brochure for your local center by changing the address. 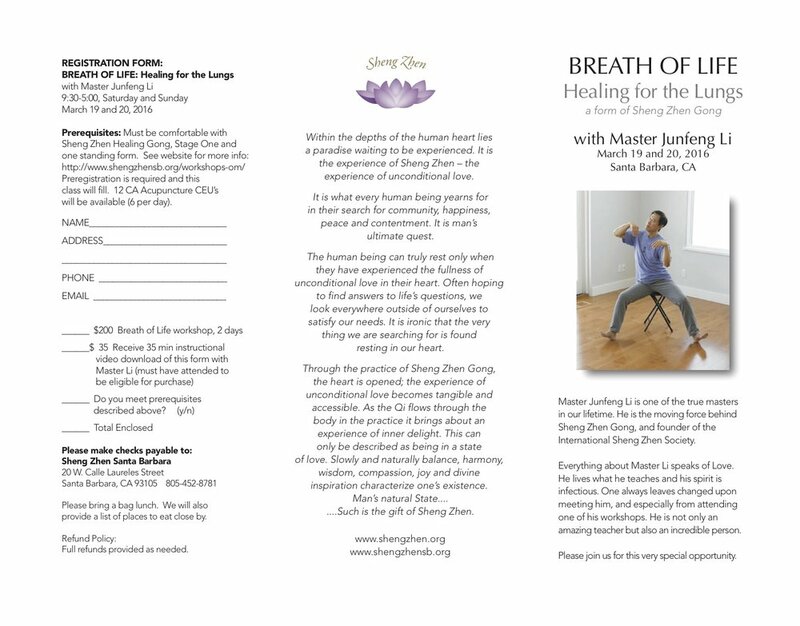 This is for the advanced training for Breath of Life. You can edit this for another form and to fit the needs of your event. You will need Adobe Acrobat or other .pdf editor to change the text. This is the brochure used for the Colorado workshop in 2016, 2 pages. You can edit it to adjust for the details of your training. 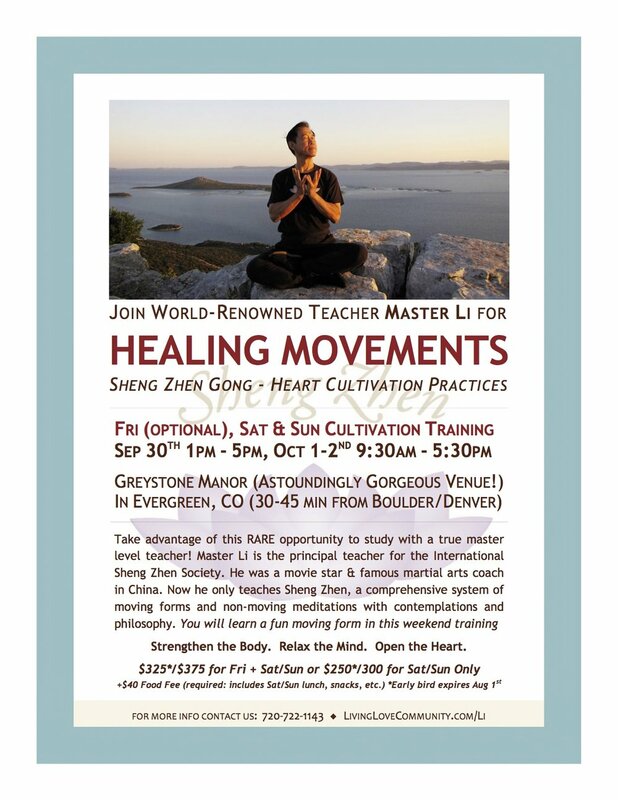 This is the one page flyer used for the Colorado workshop in 2016. You can edit it to adjust for the details of your training. This is a link to the shengzhen.org website. Look on your own computer for an arrow to download the flyer. It was made in Word. To the right is a .pdf version. One page flyer in .pdf. Flyer has Chinese characters. Light of Purity: Healing for the Kidneys Trifold - 2 pages, 2 sides, 8.5 x 11"
This is for the advanced training for Light of Purity. You can edit this for another form and to fit the needs of your event. You will need Adobe Acrobat or other .pdf editor to change the text. 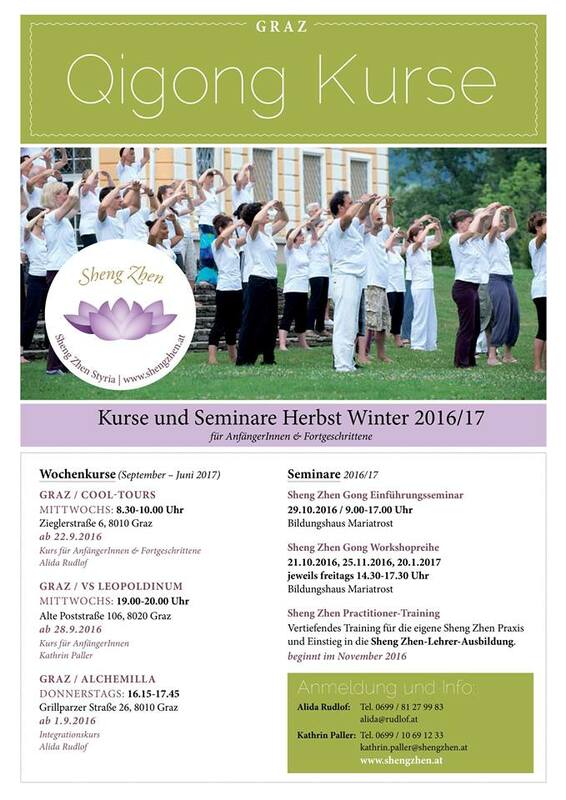 Click on the image or the link below for a .pdf of this one page flyer from Austria. You will need a .pdf editor such as Adobe Acrobat to change the flyer for your needs. Here is a flyer you can print out to inform your students about the wonderful online video trainings available through Vimeo. This is a great way to engage your students to take their practice to a higher level. Most of the videos are Master Li Junfeng and 2 are with Li Jing so far. Please fill in the form below if you have a flyer or brochure you would like to share with other teachers through the page above. Please provide a .jpg copy (if possible), as well as a .pdf and any other source material you have. Please provide a name or description of your brochure or flyer. Thank you!